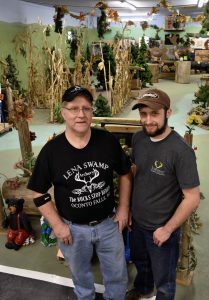 Owner Wade Jeske and his son, James, operate Lena Swamp Archery in Oconto Falls. 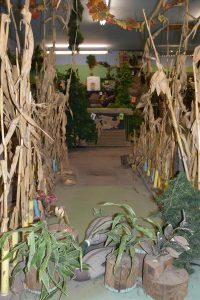 Lena Swamp Archery in Oconto Falls is a bow hunter’s paradise. That’s pretty clear right as you walk in the front door and find yourself facing rows of bows and a full supply of colorful arrows. 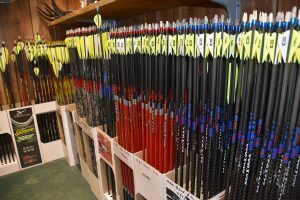 Owner Wade Jeske keeps more than 100 bows and crossbows in stock, and he’ll service any bow that’s brought in, whether it was purchased on site or not. 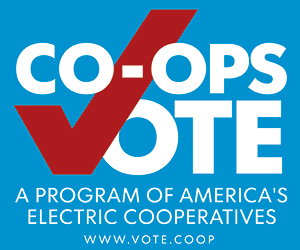 However, it’s not the attention to products that sets this Oconto Electric Cooperative member/business apart —it’s the attention to people. Opened in 1998, Lena Swamp Archery has a shooting range behind the storefront that’s in almost constant use. First of all, it’s where Jeske’s motto of “Try Before You Buy, Sight In Before You Leave” is put into play. He encourages customers to try out a bow before buying one to make sure it’s just right. Knowledgeable staff is always on hand to help. But the range also becomes a community center of sorts on certain winter weekday evenings, when archery leagues are in full swing. These leagues attract about 175 men and women who come year after year to hone their skills during the off-season and enjoy the camaraderie of fellow bow hunters. The range is unique in that it’s strictly for bow hunting rather than target shooting, with various stations set up to simulate hunting scenarios. Tuesdays evenings and Saturdays are for open shooting, when anyone is free to stop at the range and practice. Most Saturdays from 10 a.m. to 3 p.m., the range is lively with the chatter of youngsters who stop by throughout the day to shoot for an hour or so at a time. Jeske encourages youth involvement, so much that he waives a fee for children who come to shoot here. Jeske isn’t concerned about any potential lost revenue from allowing youth to shoot for free. He knows that if children develop an interest in bow hunting early on, they’ll likely remain connected to the sport and will return as paying customers five to 10 years down the road. He’s seen this happen over and over again at his own shop; many of his loyal customers started out shooting in the back-room range or as part of a school program Jeske himself helped start. She’s only 12, but this young bow hunter has an impressive shot. 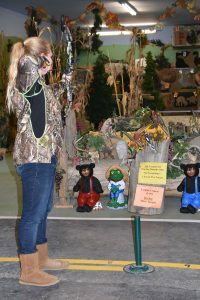 Bow hunting has grown considerably in popularity with women and children, according to Lena Swamp Archery owner Wade Jeske. He says at his shop, the sales ratio is generally two men’s bows to one youth or women’s bow. Also, Jeske simply believes in youth. “I have such faith in kids,” he said. He’s enthusiastic about introducing young people to the sport of bow hunting, an activity that doesn’t involve electronics and gets children outdoors and immersed in nature. Many of his efforts toward this aim have been in partnership with the Oconto Falls School District, which recently honored him with a Friend of Education award. Every year he opens his range to Oconto Falls fourth- and fifth-graders for a two-week phy-ed unit on archery. He also helped launch the high school archery club, which meets at his range on Monday nights and attracts anywhere from 25 to 40 teens. He’s especially keen to reach out to those students who might face challenges when it comes to taking up bow hunting. To help keep the activity affordable for all youth who develop an interest in it, Jeske encourages customers purchasing a new bow to consider donating their old one, making the equipment available to students to use until they’re able to afford their own. He doesn’t charge for the use of these donated bows; Jeske’s found this type of activity tends to pay forward. Some of the students who developed their skills with a borrowed bow have grown to eventually contribute to the very program they once benefitted from. Jeske believes in youth, but he also contributes to the local schools out of gratitude. He and his wife, Tina, have three children. James (pictured on the cover with his father) is a business student at UW-Green Bay; he helps run Lena Swamp Archery. The two younger children, Jacob and Jenna, have autism and have benefitted from the school’s special services. In addition to hosting phy-ed classes and archery club gatherings, Jeske is involved with fundraisers that support a variety of school and community organizations, such as Boy Scouts and Girls Scouts. 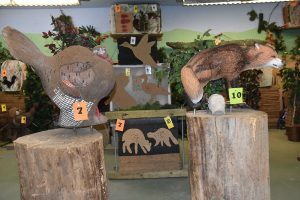 He estimates the fundraisers have brought in over $100,000 for various community organizations over the past 13 years that he’s been involved. He’s been just as generous with his time. In 2005 Jeske coordinated the state’s first Learn to Hunt program, which aims to provide experiences for children who might not otherwise have an opportunity to go hunting. He still serves as a coordinator for the Department of Natural Resources Learn to Hunt program for turkey hunting. Jeske has also served as a DNR bow safety instructor, and he taught hunter safety courses for youth at the archery shop for 10 years. During that time, about 2,300 youngsters received certificates in gun and bow safety under his tutelage. The time he’s invested in that program, he noted, has also paid off, as his first class of hunter safety students are now 27 or 28 years old, some with children of their own. Many of these former students are loyal Lena Swamp Archery customers who are now helping to introduce the next generation to bow hunting. It’s this personal touch that has helped a business like Lena Swamp Archery thrive for two decades despite competition from online retailing and big box stores, including a sprawling Cabela’s located just down the highway in Green Bay. Jeske, in fact, has managed to turn that presence into an advantage, offering the service and repair that the big store does not. Jeske gets plenty of service referrals from Cabela’s, and these visitors are treated with the same care that’s given to longtime, regular customers. Also, Jeske noted that about 90 percent of service needs can be taken care of within 24 hours and sometimes even less, so many out-of-town customers can simply wait while their bow is being serviced and then continue on their way. 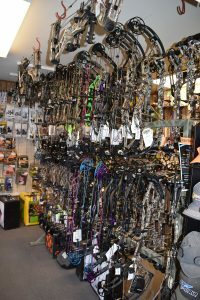 The store’s extensive inventory—much larger than at most independent archery shops—also helps. Jeske keeps enough equipment in stock to ensure everyone who walks in the door in search of a bow will be able to walk out with the right one in hand. These customers come from all over the state. 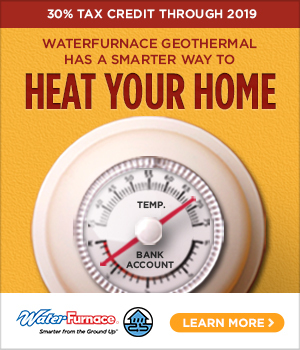 Customer Brad Heckel agreed. He was in the market for a new bow on the day we visited, and he reasoned that he didn’t want to wait two weeks for an order to arrive before he got a chance to try it out. Heckel knew that Lena Swamp Archery would have what he was looking for, both in inventory and in service. He’s a longtime customer, whose three children are graduates of Jeske’s hunter safety program. The youngsters busy practicing their shots seem equally satisfied, but for a slightly different reason. They come here just because Lena Swamp Archery is a great place for a bow hunter of any age to spend an afternoon. Lena Swamp Archery is located two miles west of U.S. Highway 141 on State Highway 22, near Oconto Falls. For more information, call 920-846-0211, visit lenaswamparchery.net, or look up Lena Swamp Archery on Facebook.